Marketing Information: Add a CPU heatsink and fan cooler to a Socket 7/370 system. Measuring 65x60x45mm, this Socket 7/370 CPU Cooler/Fan is a combination heatsink and fan designed to cool high performance CPUs. 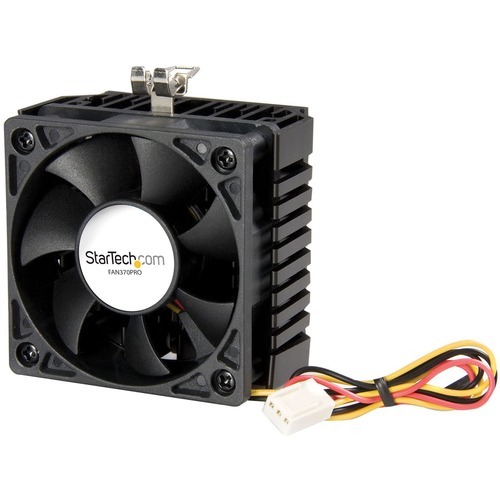 The Socket 7/370 CPU Cooler offers an extra-large heatsink combined with a quiet running 6x2 cm brushless ball bearing DC motor. The fan features a high-efficiency blade design capable of moving 21.46 CFM, providing enough cooling capacity for Pentium III and Celeron CPUs up to 1.4 GHz. The Socket 7/370 CPU Cooler is powered through a TX3 (3-pin) connection to the computer power supply, and is a suitable cooling solution for Intel Pentium III and Celeron CPUs up to 1.4 GHz and AMD K6 processors at any speed. Please note: to power the Socket 7/370 CPU cooler using an LP4 (4-pin) connection to the power supply, please see our TX3 to 2x LP4 Power Y Splitter Cable (CPUFANADAPT).